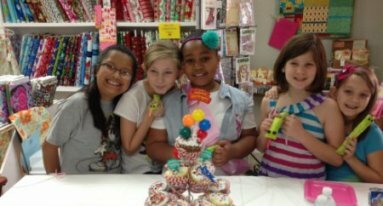 Celebrate your birthday with your friends at Gigi's Fabric Shop. Let's have fun together while creating a keepsake for you and your friends to take home. Or create a project sewn for a local charity of your choice. You and your friends will sew and have a complete sewing lesson while celebrating your special day. We will provide the sewing machines and precut materials for your friends. We will assist with decorating the room for you and allow some time for dessert too. Head on over a few days before to choose the fabrics of your choice. You can choose one set or a variety for you and your birthday friends. Sewing Projects available that you can choose from: Doll clothes for 18 inch dolls such as American Girl, A Tote Bag, Pillow Case, Drawstring Bag, Twirly Skirt or a project you wish for. We are open to listening to your creative ideas. You can also make a pillowcase to be donated to Cases for Smiles to give to children at Brandon Regional Hospital. Guided Sewing lesson 1.5 hours and then a half hour available for the happy birthday song and presents. Groups up to 10, but if you need more we can plan ahead. "Just wanted to say thanks for a lovely party. All the girls really enjoyed sewing with you. Hopefully it is just the beginning for them." " Gigi this is the best birthday party ever!" " Gigi when I first started sewing I was scared, but now I LOVE it." " Mom, I didn't know sewing was so much fun. Can we have my birthday party here too?"